Building services refers to the equipment and systems that contribute to controlling the internal environment to make it safe and comfortable to occupy. They also support the requirements of processes and business functions within buildings, for example manufacturing and assembly operations, medical procedures, warehousing and storage of materials, chemical processing, housing livestock, plant cultivation, etc. For both people and processes the ability of the building services engineering systems to continually perform properly, reliably, effectively and efficiently is of vital importance to the operational requirements of a building. 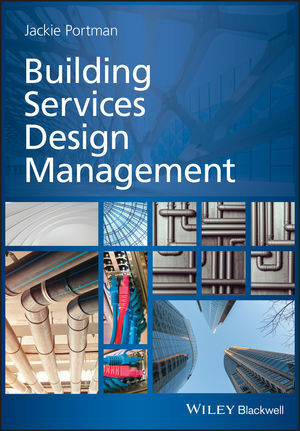 Typically the building services installation is worth 30-60% of the total value of a contract, however existing publications on design management bundles building services engineering up with other disciplines and does not recognise its unique features and idiosyncrasies. Building Services Design Management provides authoritative guidance for building services engineers responsible for the design of services, overseeing the installation, and witnessing the testing and commissioning of these systems. The design stage requires technical skills to ensure that the systems are safe, compliant with legislative requirements and good practices, are cost-effective and are coordinated with the needs of the other design and construction team professionals. Covering everything from occupant subjectivity and end-user behaviour to design life maintainability, sequencing and design responsibility the book will meet the needs of building services engineering undergraduates and postgraduates as well as being an ideal handbook for building services engineers moving into design management. Jackie Portman is a Senior Building Services (MEP) Design Manager with over 25 years’ experience in consultancy, contracting and project management in the UK and overseas. She has led the design management process of a range of projects in terms of complexity, size and uses: university complexes (libraries, archive buildings, state-of-the-art education and research facilities), healthcare projects (wards, laboratories, clinical areas), single and mixed-use commercial office complexes, residential developments and schools. Her particular areas of expertise are in consultant selection and appointments, managing the design and pre-construction activities, ensuring that commissioning management procedures are put in place, and closing out and handing over successful projects. The author is also experienced with instigating post-occupancy studies to understand how the building services engineering designs worked for the building occupants, operations and maintenance staff.